An all-ages comic that truly does appeal to a wide range of readers is sometimes difficult to find. 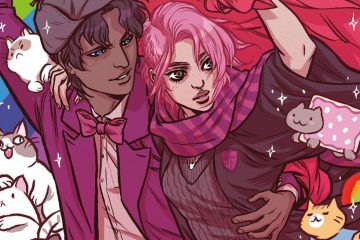 Even more rare is an all-ages comic series dealing with monsters and ghouls that hits those beats. 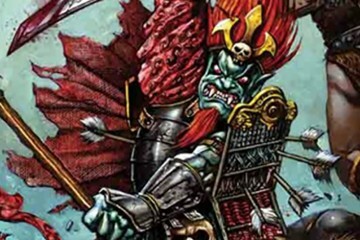 Writer Troy Vevasis aims to change that with his character Mr. Crypt, a skeleton who rose from the dead and is misunderstood and reviled by nearby villagers, and who stars in an Alterna Comics series of the same name. This sweet, sympathetic character is joined by his friend Baron Rat, who gets his starring one-shot comic in this September’s Baron Rat and the Great Cheese Caper, following the hijinks Baron gets up to when Mr. Crypt is busy at work. 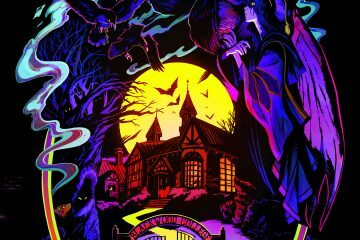 I spoke with Mr. Vevasis recently about the conceit of Baron Rat and the Great Cheese Caper, his place in the world of Mr. Crypt, and why he wanted to tackle an all-ages horror book. FreakSugar: Before we discuss your Baron Rat and the Great Cheese Caper one-shot, what can you tell us about the world of Mr. Crypt? Troy Vevasis: Mr. Crypt is a skeleton who rose from the dead when a bolt of lightning hit his grave one night. He walked into town and the villagers feared and hated him so they chased him. He was able to escape and he stumbled upon a disguise and uses it to hide from the villagers. He gets into a lot of crazy situations as a result. I was always a big fan of classic horror and monster movies from the 1930s and 1940s. 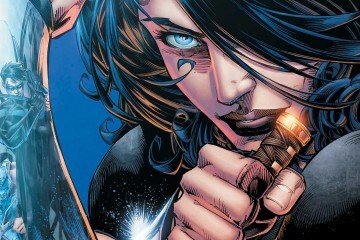 I wanted to do something like that but with an all-ages twist. I wanted to take something that most people find creepy and turn him into a character to sympathize with and care about. FS: Baron Rat is a friend of Mr. Crypt in the first miniseries. Who is Baron Rat and how does he connect to Mr. Crypt’s world? TV: Baron Rat is a rat who Mr. Crypt discovered in an abandoned shack. Baron Rat becomes Mr. Crypt’s pet and best friend. His carefree attitude makes him very interesting and stark contrast to the more cautious personality of Mr. Crypt. Baron Rat is a character that I think has a lot of potential. FS: What can we expect to see in the Baron Rat one-shot? What is the conceit of the story? TV: Baron Rat and the Great Cheese Caper follows Baron Rat on his misadventures while Mr. Crypt is at work. Baron Rat loves cheese and when he discovers a cheese festival in town a wild series of events follows. The book will show the kinds of trouble that Baron Rat finds himself in when Mr. Crypt isn’t around. It is a fun all-ages story! FS: The trade paperback of Mr. Crypt is hitting in October. What can you tell us about the trade? 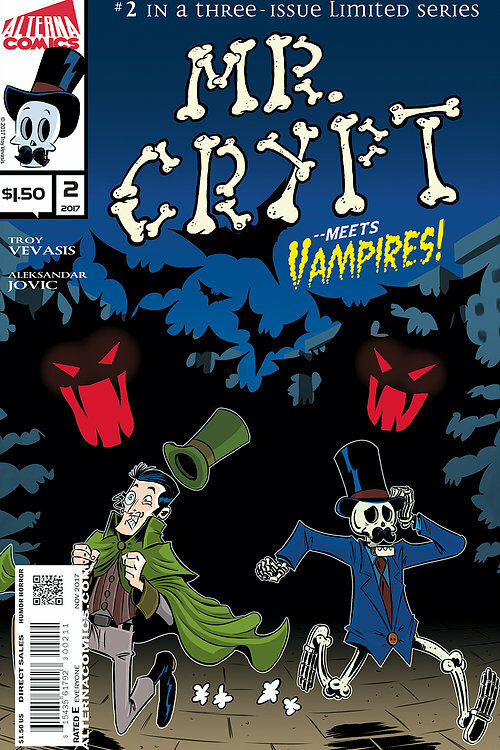 TV: The Mr. Crypt trade paperback will include all three issues of the Mr. Crypt miniseries along with a new cover. FS: Do you have plans for further Mr. Crypt miniseries or other standalone stories? TV: Mr. Crypt and Baron Rat will next appear in a series of one page comic stories in the upcoming It Came Out on a Wednesday anthology series published by Alterna Comics! 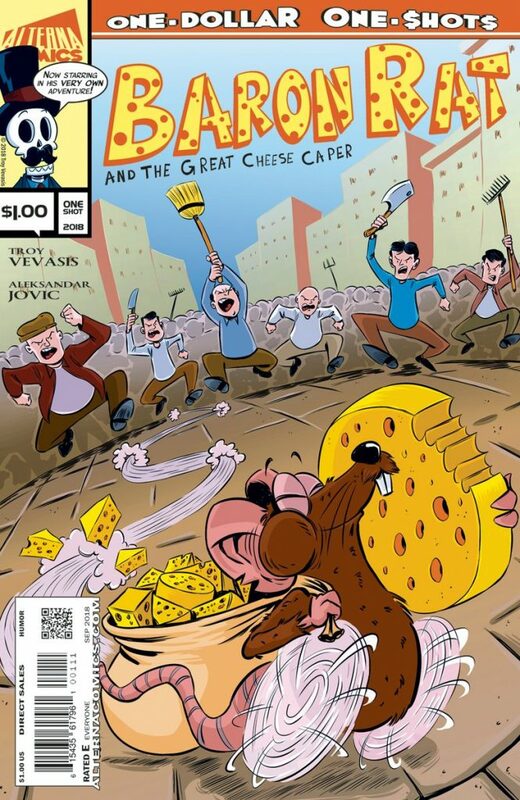 Baron Rat and the Great Cheese Caper debuts September 26th from Alterna Comics.